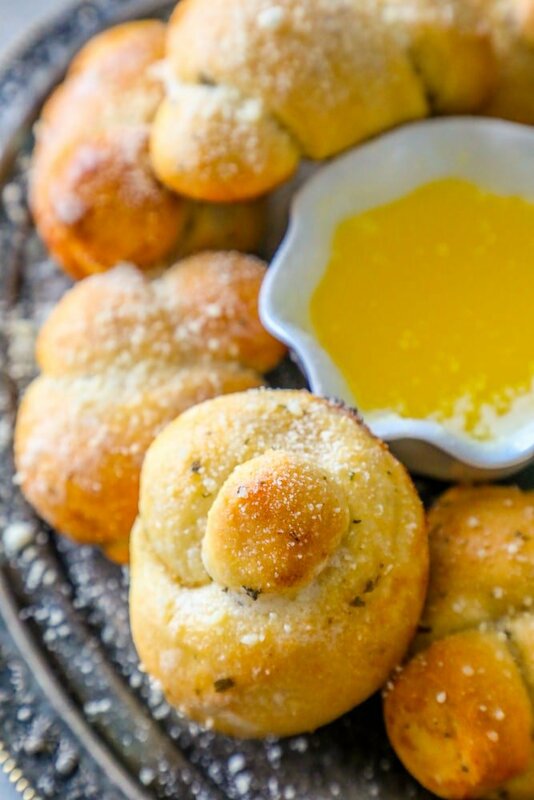 The Best Easy Garlic Knots Recipe – delicious easy garlic knots that taste just like they are from your favorite pizza joint but a million times better and so budget friendly! I’m sharing these easy baked garlic knots as a part of a fabulous fall blog hop – centering around delicious and easy fall appetizers and snacks! I’ve teamed up with some of the most amazing food and lifestyle bloggers around to share our favorite easy appetizers that are perfect to cozy up with this fall. 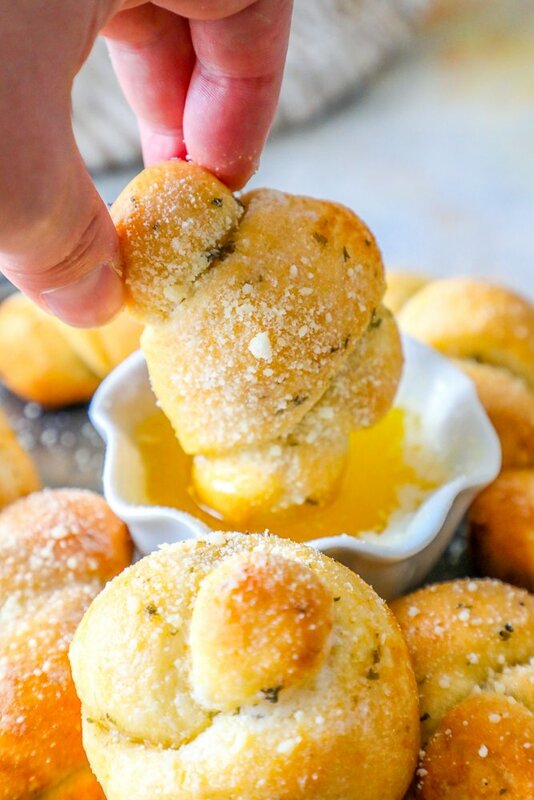 I’m bringing my absolute favorite app ever – my Easy Baked Parmesan Garlic Knots! 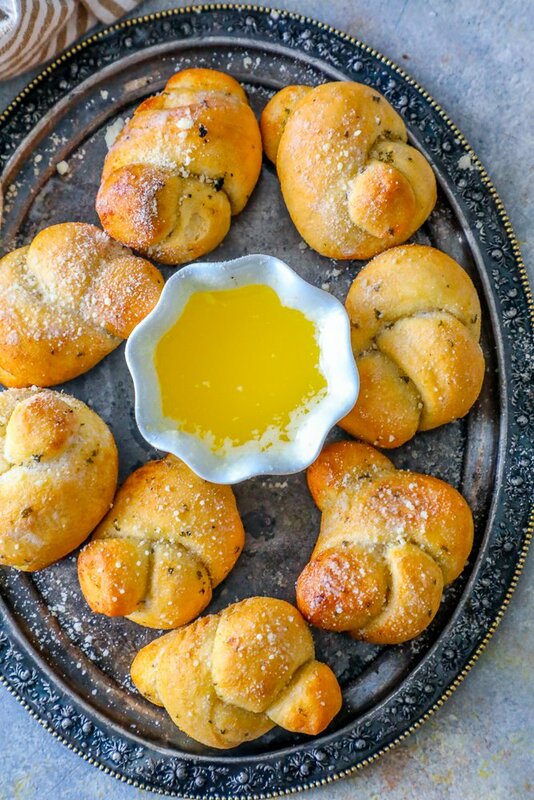 These easy baked garlic knots are super simple – and crazy delicious. This is sure to become one of your family’s favorite recipes in no time! I hope you love it as much as we do. 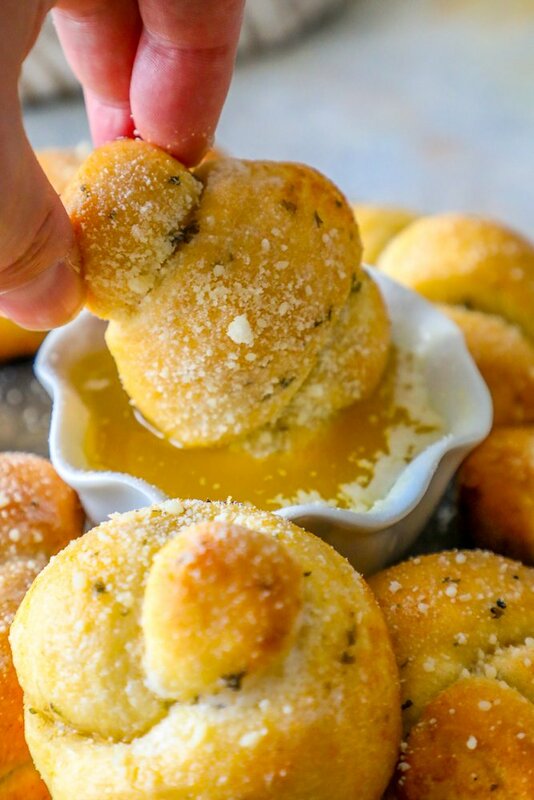 Just take me to the best easy garlic knots recipe ever, already! 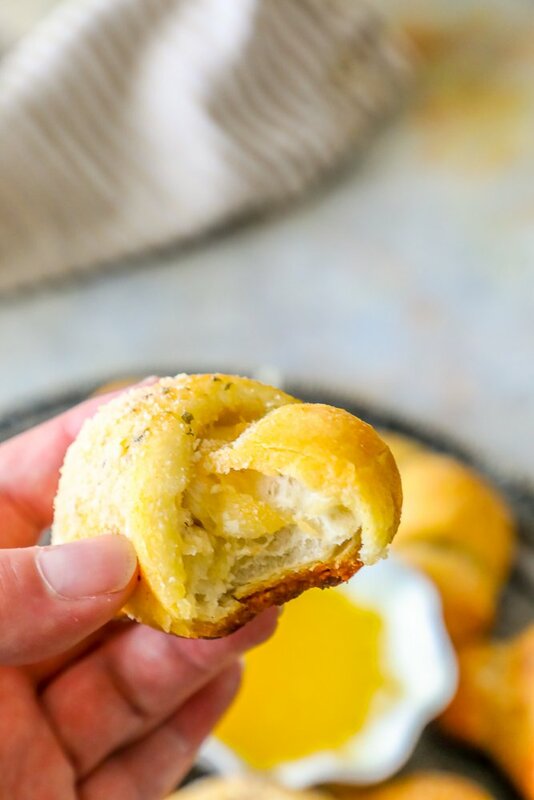 If you’d like to skip my tips and tricks to making perfect easy garlic knots, as well as check out some of the recipes I like to serve these baked garlic rolls with, please scroll to the bottom of the page (just before comments) to get to the easy printable recipe. This is a long post, but I get a ton of questions so I try to add plenty of information in them to help save time! I’m bringing these easy baked garlic knots to a little online appetizer party with some of my absolute favorite bloggers as a recipe party! We’re sharing our favorite delicious bites – and hoping you’ll find some new blogs to follow and love. I can’t say enough about the bloggers sharing their favorites here – they are all so amazing and have some of the best recipes on the internet! Please click through to see all the delicious ideas we’re sharing today. 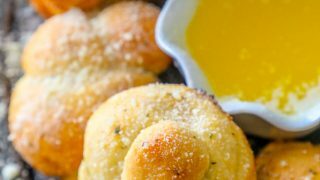 If you love these delicious baked garlic knots, you might want to kick them up a notch with a delicious dipping sauce on the side. Butter with lemon and garlic. Olive oil and balsamic vinegar. If you love the best easy garlic knots recipe as much as I do, please give it five stars and help me share on facebook and pinterest! 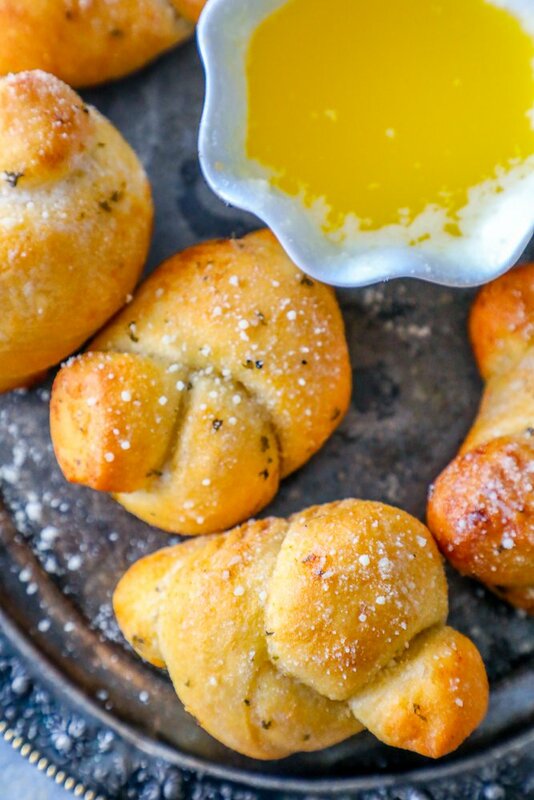 The Best Easy Garlic Knots Recipe - delicious easy garlic knots that taste just like they are from your favorite pizza joint but a million times better and so budget friendly! In a small bowl, whisk together butter, Parmesan, garlic powder, oregano, parsley and salt; set aside. Halve each of the 8 biscuits, making 16 pieces. Roll each piece into a 5-inch rope, about 1/2-inch thick, and tie into a knot, tucking the ends. Place knots onto the prepared baking sheet and brush each knot with half of the butter mixture. Place into oven and bake until golden brown, about 8-10 minutes. Serve immediately, brushed with remaining butter mixture. I’d never turn down a garlic knot. These look so flavorful!! Um, yes please! I can almost smell and taste these through the PC monitor! oh my!! these have me drooling!! and craving garlic rolls at 7:30am! !